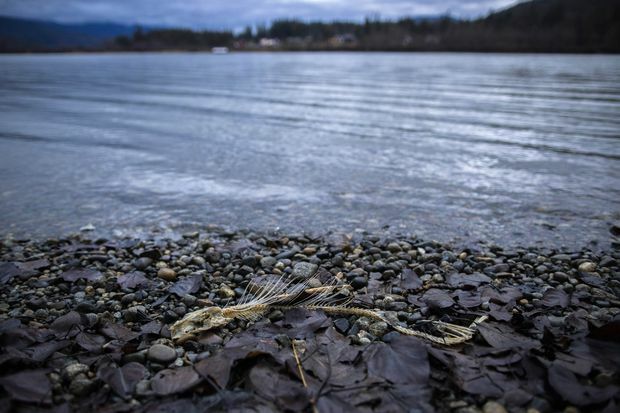 A carcass of a fish lays on the shore near a popular fishing area on the Fraser River in Abbotsford, B.C., on Dec. 20, 2018. This year was supposed to offer a turnaround for B.C.’s iconic chinook salmon, as Ottawa woke up to concerns about dismal returns − and the resulting threat to endangered whales that rely on these fish for sustenance. But a promised reduction in the chinook harvest didn’t actually curb fishing, and the number of salmon that returned this year to the Fraser River, pivotal to their survival, is being described by conservationists as a crisis. Figures released by the Department of Fisheries and Oceans (DFO) shows that the number of chinook caught in the Strait of Georgia and in Juan de Fuca Strait was higher than in 2017, even as the number of fish making it back to their spawning grounds tanked. The only in-season test fishery, on the Fraser river, found that the chinook returns for 2018 were well below the historical average. Considering everything that Ottawa threw at this challenge in 2018, it’s not an encouraging result. The federal government has trotted out a series of announcements − most of them advertised as “bold” − to demonstrate that, despite its determination to increase oil-tanker traffic through the foraging grounds of the endangered southern resident killer whales, it really does have a recovery plan. In the spring, Ottawa officially recognized that southern resident killer whales face an imminent threat to their survival. A $167-million Whales Initiative was announced. Fisheries Minister Jonathan Wilkinson and Environment Minister Catherine McKenna recommended an emergency order for the whales under the Species at Risk Act, but their cabinet colleagues rejected their advice this fall. Instead, Ottawa announced an additional $61.5-million fund targeting key threats faced by the whales, including the lack of chinook salmon. The government has also set new limits on whale watching and imposed vessel slowdowns in key foraging areas for the marine mammals. Regulatory controls on contaminants have been boosted. But the most high-profile measures was the announcement of a reduction in the chinook fishery by 25-to-35 per cent, which the government promised would “help conserve this important species and increase prey availability for southern resident killer whales.” Lack of prey is one of the critical factors that has reduced the number of this population of whales to just 74 animals. Greg Taylor, of Watershed Watch, one of the six conservation groups that called for a broad closing of the chinook fishery this year, said the DFO numbers demonstrate that Ottawa’s promise to manage the fishery has failed. He noted that the critical area for the southern resident killer whales − and important for Fraser River chinook − is defined by DFO as Area 20, off Vancouver Island’s southern west coast. The chinook catch in 2014 was 18,000. This year, while the population of southern resident killer whales continued to dwindle, the catch was 28,000. Jeff Grout is DFO’s regional resource manager for salmon, and he cautions that it is too early to say if the reductions were successful. For every fish caught, the heads are required to be turned in to fisheries officials, who will analyse where those chinook came from. At that time, the Department of Fisheries and Oceans would not provide figures for how many fish could be caught under the new targets. Coming up with a clear answer was difficult, in part because DFO does not know how many chinook there are. That was made clear in internal documents obtained by The Globe and Mail this year, showing that even within the department, senior officials believe they have lost the ability to keep track of salmon on the West Coast. But there is still more to come. On Dec. 19, the Fisheries Minister added another new critical habitat off the coast of southwestern Vancouver Island for the killer whales of the Salish Sea. The “critical habitat” designations ensures they are legally protected against destruction that could hinder survival or recovery of the whales, and he said that won’t be the end of it.